Reading of letters written by a woman homesteader, Elinore Pruitt Stewart (1876-1933) in Wyoming around 1910. Part 3 of 3. These three episodes of Stewart's letters were part of a continuing series on KPFA based on women’s diaries and letters. Part three: This portion begins in December 1913. Stewart describes Christmas with her neighbors; how they helped two Mormon women and their children who were all in need; and other adventures Stewart has with her friend and neighbor, Mrs. O'Shaughnessy. The materials used in this program come from "Letters of a woman homesteader" by Elinore Pruitt Stewart, published by the Houghton Mifflin Company, Boston. Elinore Stewart's letters were copyrighted by herself and by Atlantic Monthly in 1913. The letters are read by Luce Morgan; produced and narrated by Brett Vuolo; the music is provided by Larry Packer; technical production by Peter Zanger. 3 reels (85 min.) : 7 1/2 ips, mono. These terms will not bring up a complete list of all items in our catalog associated with this subject. Click here to search our entire catalog. 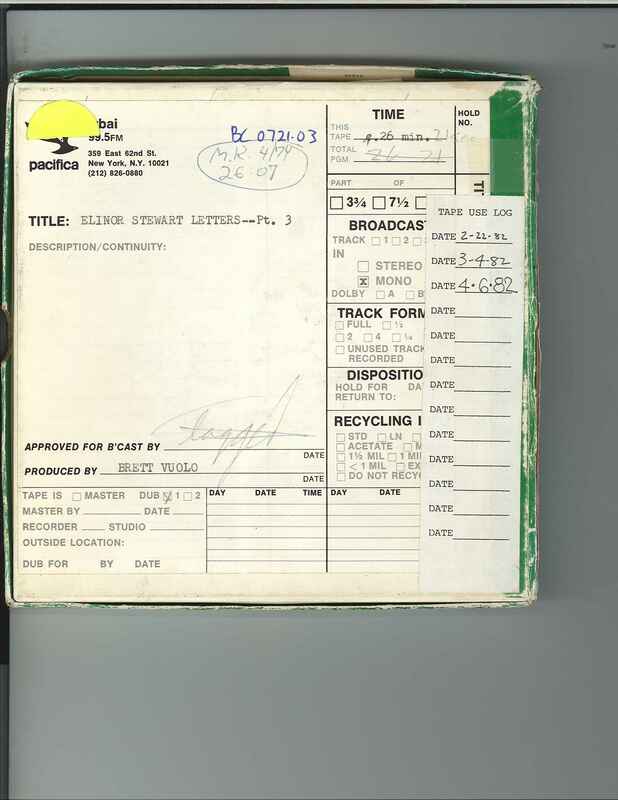 This recording has been digitally preserved as part of Pacifica's American Women Making History and Culture: 1963-1982 grant preservation project, and is available for research and reference . Please contact the archives via telephone: 818-506-1077 or email: americanwomen at pacificaradioarchives dot org for information on how to obtain a copy of this program. Thank you.